Our brilliant new Adult Easter Egg Fancy Dress Costume is an original fancy dress idea that’s a great alternative to bunnies and chicks, with a colourful design that’s sure to go down well with all ages. 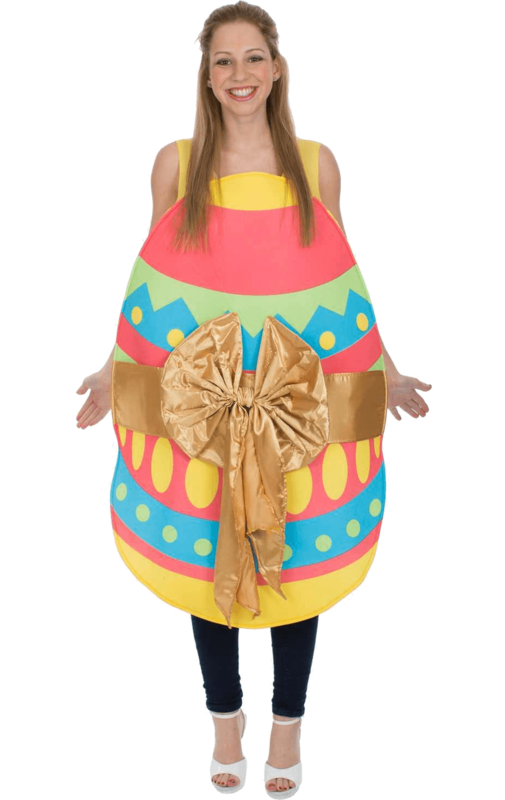 The Adult Easter Egg Fancy Dress Costume is a brightly coloured tunic in the shape of an Easter egg with a large gold bow at the front. The pattern on the egg is a vibrant geometric design of primary colours that looks like a painted Easter egg. Behind the egg front, the body of the tunic is a yellow sleeveless top that allows it to be worn comfortably and allowing plenty of movement, making it perfect for energetic activities like Easter egg hunts, and the lightweight design will keep you moving freely when wearing it. The loose-fitting top closes with Velcro fastenings at the back of the neck to keep it in place while allowing flexibility for wearers of different sizes. In combination with the durable and comfortable material, this makes the outfit a fantastic and fun idea for any Easter event.